It was an incredible day in spring off of Jupter, FL, USA on April 16, 2005. That day at Jupiter was strong by SE Florida standards. The wind had gusted up into the 45 mph range since the previous day* and this waves in this renouned waves spot were really going off. There were two breaker lines, one over 1/2 mile offshore where they waves were breaking around 12 to 15 ft. high and another line inside. The waves were running in from the East to East North East. The area between was a bit smoother and "appeared" to be more rideable. Still, the local riders used to the big stuff that runs off the coast here were staying off the water in droves for some reason. The surf can get fairly large off of Jupiter. This was a smaller one by comparison near the inside break during the Jupiter Kite Invasion earlier in the year. 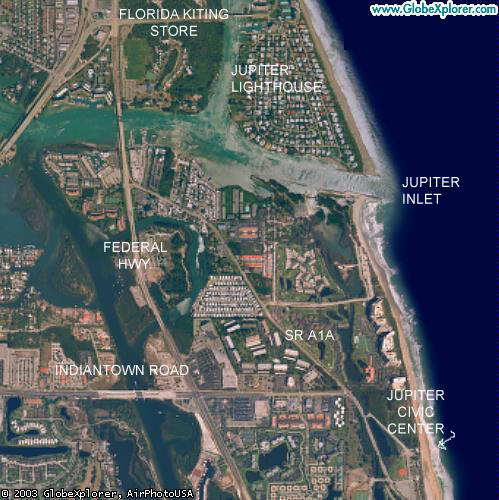 A bunch of guys had driven up from Ft. Lauderdale to do a downwinder from Jupiter Inlet south to kitebeach where the Jupiter Kite Invasion is held. One rider, Neil Hutchinson suffered a broken leg in one breaking wave near the start of the downwinder. The guys started just south of Jupiter Inlet and intended to ride down to land in front of the Civic Center. Some big surf off Jupiter at the outer break, three years before to the day! Our rider launched a new 11 m Slingshot Fuel on new lines and a bar and headed on out. 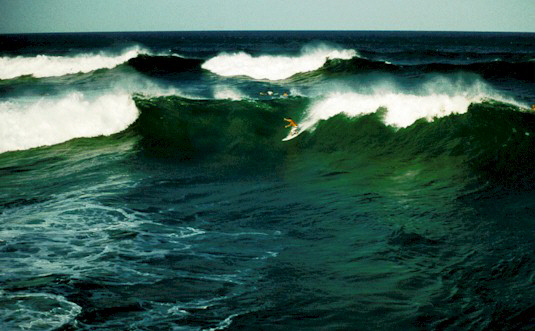 It was the largest surf that he had kited in before in the 1 1/2 years he had been riding and was having a great time. He had worked his way out past the outer break about 1/2 mile offshore and was wave riding and loving it. He got a little too preoccupied on one wave he caught as he ran past his kite on a speeding wave and stalled it. The kite hit the water while the rider rushed to relaunch it. He was suddenly hit from behind by a breaking 12 to 15 ft. wave and thrust underwater and rolled in his kite lines. He was slammed into the bottom and bruised his left side in the process. He estimates he was held under for about 30 to 40 seconds when he was able to surface to catch a breath. He was totally wrapped up in lines all over. The wave that shoved him under initially then slammed into his kite and pulled him underwater for what he estimated to be a minute. The lines were slicing into his neck, wetsuit, thigh and ankle as he was ripped along at high speed underwater by the wave. The water force would compress him into a ball along with the line wraps cutting into him all over. His mind started screaming "DO SOMETHING" or else he was thinking he wasn't going to make it through. He remembered his hook knife at the back pocket of his Dakine Fusion seat harness. He reached around and grabbed it. He reached up and cut at the line slicing into his neck and causing considerable pain. He managed to free the line which spun him around. 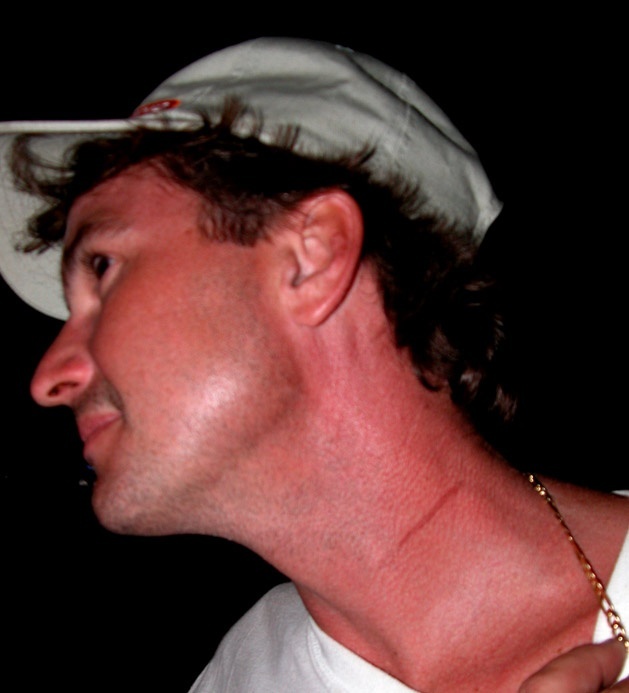 The rider in happier times, at the Kite4Girls wrap party in Miami, sporting a neck scar over a month later. A closer look of the neck and the first area in which our kiter gained some freedom with his first successful efforts to cut away line. He was able to surface for two quick breaths before being yanked under by the next wave and hauled forward by line wrapped all over his right ankle and leg. 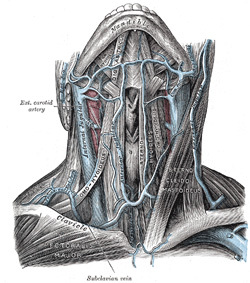 We are very vulnerable to shallow (say 1/4 to 3/8 inch), cuts, over our jugular and carotid blood vessels. I understand such a cut can extinguish life in 15 minutes. For those than may not realize it, our kite lines have sliced through fingers with blinding speed. Making a 3/8 inch neck cut would be very easy to do with traction kite lines. THIS IS ALSO AN EXCELLENT REASON TO NOT FLY KITES UPWIND OF INNOCENT BYSTANDERS. A kite loaded up with the force of a 15 ft. breaking wave with an array of spectra line pulling into soft flesh? Our rider was very fortunate indeed. 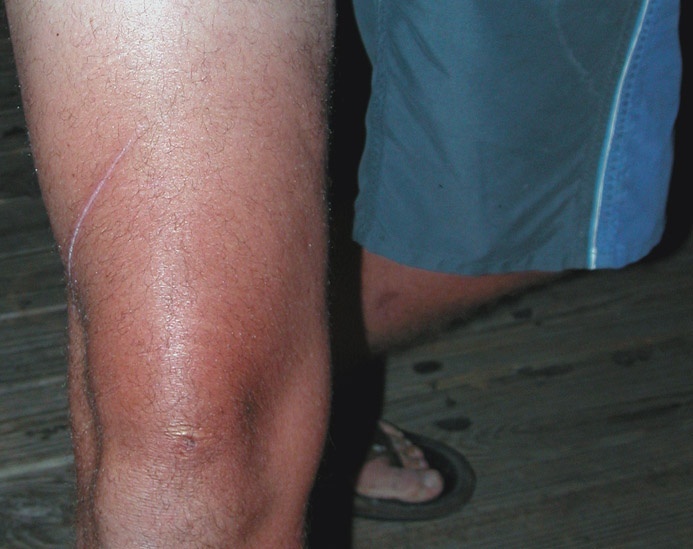 The line cut behind his right thigh. He was a bit more confident this time knowing that he had a shot at cutting himself out of this dangerous situation. He cut one more line and was able to surface. He then proceeded to grab and cut every line he could see spewing around him in a cloud. and across the front of his thigh. Again, these photos were taken a month after the accident. Eventually, the kite pulled free and drifted into the shore break. It hit the beach and started to blow inland. Someone on shore ran after it and secured the kite. The rider then drifted and swam into shore totally exhausted. He hit the beach and was so totally stoked to still be alive. A girl ran up, said she saw everything and asked if he was OK. A policeman drove up on an ATV and asked the same thing. The rider suffered cuts to his right ankle, thigh and neck. He felt the cuts to his neck would have been more severe if not for his shortie wetsuit which was sliced up somewhat. A Dakine Fusion seat harness similar to the one the rider had on and the hook knife shown in the pocket. There is a good chance this rider might not have made it but for this knife. * The day before was even stronger and it honked all night building up some substantial seas. I asked the rider what he would do differently in the future? He said if the locals are staying off the water he would think that over very carefully before rigging up and heading out. Some new experiences can be a bit too new and extreme. It may be better to blow off rigging up until more familar conditions are on. Also, he would keep a eye on his kite while riding and not allow himself to get distracted and ride past it again stalling the kite. 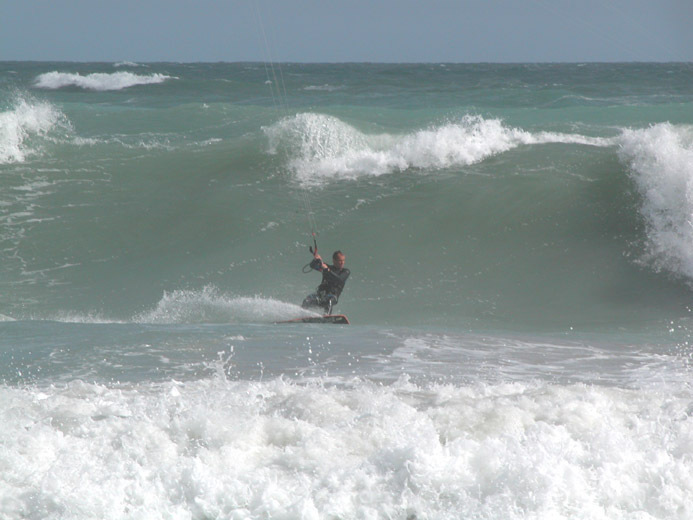 Wave kiteboarding requires some special skills and a fairly fast manuverable kite perhaps on shorter lines as well. He would rig shorter lines in the future than the 27 m lines he had up that day. He would also wear an impact vest to try to even the odds a bit more. IMPORTANT: make sure your hook knife won't readily snag line where it is secured. If you attach it to your harness make sure the attachment will break away say under line loading. DON'T use fastenings that can catch line like some carabiners. Some cave divers, using only one line often under tension have been known to carry up to FIVE knives. Kiteboarders only have 400 ft. of line flapping around over head with a breaking strength of 600 lbs. Who needs knives? Another variety of hook knife taken from hang gliding and paragliding. This one is designed to make it harder to cut your finger by accident. Two razor blades also improve the cutting efficiency. A smaller, more traditional type of hook knife that can allow an accidental finger cut. If you don't carry a couple of knives currently, you should consider rigging up. If you have a hook knife in your harness pocket make sure you can get at it fairly easily. It is a good idea to wash the knives off with freshwater after riding sessions and to coat the blade only with some light oil. you could always break that 600 lb. line with your hands or teeth!? "kite knife came in handy for me once. cold water, 7m kite, xmas day. dropped kite in water, before i relaunched, got caught on a crabpot float. as it launched, the float was in the lines and slid all the way down the lines to the bar. it was all covered in seaweed and barnacles, and i was wearing gloves. i figured i would pull it off, but it was tough. almost instantly i started getting pulled underwater b/c the downwind pull of the kite at noon was thus pulling the crab pot line downwind (since it was attached to me), and therefore (draw the line diagram to understand) pulling me 2-3 feet underwater and drowning me! since there were swells i was able to grab a breath in a trough and then hold it while i detached myself from everything. very scary. t hen my kite was flying off the float.... i had to cut if off with the knife and self rescue. so the knife didn't save the life, but let me get my kite back. surprisingly scary situation however." 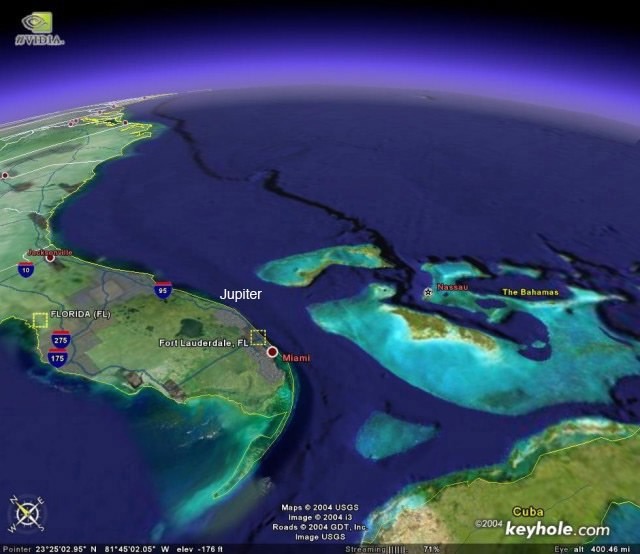 There was another case in which a kiteboarder was riding near a bridge in the Florida Keys. He dropped his kite to the water while the strong tidal current carried things beneath the bridge. His lines wrapped on a snag on a piling underwater as the current loaded his kite up and pulled it downcurrent. The rider became tangled in his lines. As a result the kiter was pulled underwater and kept there. This was a few years ago and he wasn't carrying a knife. If a nearby fisherman hadn't noticed what happened and jumped in with a fillet knife our rider might have easily drownd. That's a pretty unreal rescue story about that fisherman. Wow! He must have acted instantly to save the kiter. Definite hero. Is a hook knife always the best way to go? They make 6" (3" blade, 3" handle) titanium, blunt (so you don't stab yourself or your kite) diving knives with carrying case like this one http://www.scuba.com/scuba-gear-30/0...-BC-Knife.html You can also get a 20" retractable leash for it so you don't loose it or drop it? Good choice or too much? Here is a great post about knives. Some hook knives are better than others in some respects. Two blades converging in a good cutting zone are optimal. In an emergency it is easy to not only drop the knife but also cut yourself with some that have a wide enough gap. Some guys use short diving knives. If you go with one I would suggest an effective serrated edge. Whatever you use I would make sure it is easy to grab and hard to tangle. Some guys have sewn retaining pads on to their spreader bar pad to accomplish this. As useful as a retaining lanyard might be I would be careful with using one due to tangle risks or at least with line with a significant breaking strength. It sounds like there was a fatality in California due to something like this last weekend. Information is still being developed on that, in the meantime here's another similar incident. My deepest thoughts for Scott and his family. A very similar accident (luckier outcome) happened to me in HMB Tursday PM. I want to share this and hope it will prevent more injuries. 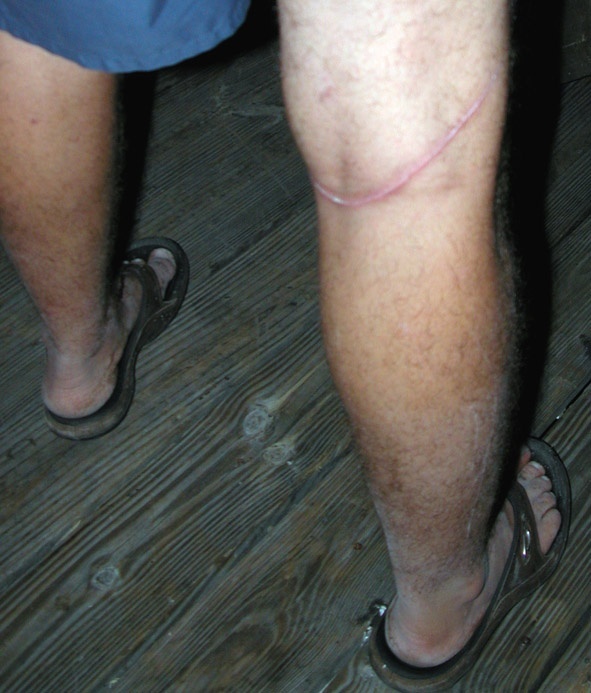 Kite line wrapped around my right ankle, and I can tell you that I did have a knife but could have never been able to use it. Here is what happened. Went out kiting with two buddies. 25-30kt winds and big swell, 4pm. Rigged my 7m, we launch each other and head out in the surf. I had a hard time to pass the break, waves kept crashing in front of me. I finally catch up with my friends and we ride a couple tacks not far from each other. I am just downwind of them. Seconds later, trying to go over a large wave, I fall and get thrown out by the wave. Kite lines get slack and I fall in one line, the kite crashes and prepares to relaunch. We're about 150 yards form shore. At the same time I feel one line wrapped around my ankle. I pull the quick release, a quarter second later, the same wave that kicked me out hits my kite and my entire body gets pulled underwater. pulled by my ankle. I spend about 20 seconds underwater, pulled by the ankle. Enough time to think about the knife in my harness pocket. Enough time to realize it would be impossible to reach my foot with such a pull. Just impossible. Terrible feeling, hopeless, brutal and out of reach. After the third wave, I am completely out of breath, the kite line let go. Miracle. Grabbed the bar and used the shredded kite and waves to pull me back to shore. My two buddies did not have time to see what happened, they just saw the kite down but what was happening at the same time was underwater and happened fast. 2 minutes maximum. We have been riding together for years and this is the first serious accident. All the other times we kited in surf, there was no tangle. Just a kite down. Not this time. I can ensure all of you that even with a kite knife, it was impossible for me to reach the line attached to my foot with the waves pulling the kite and so much tension in the kite line, out of reach. Picture of my ankle that was still double size yesterday. There is a great danger with kite lines. If they wrap around your body and your kite gets pulled in the waves, it is almost impossible to do anything. What kind of safety to avoid such accident? - had two friends nearby, they did not see anything happen, too fast. 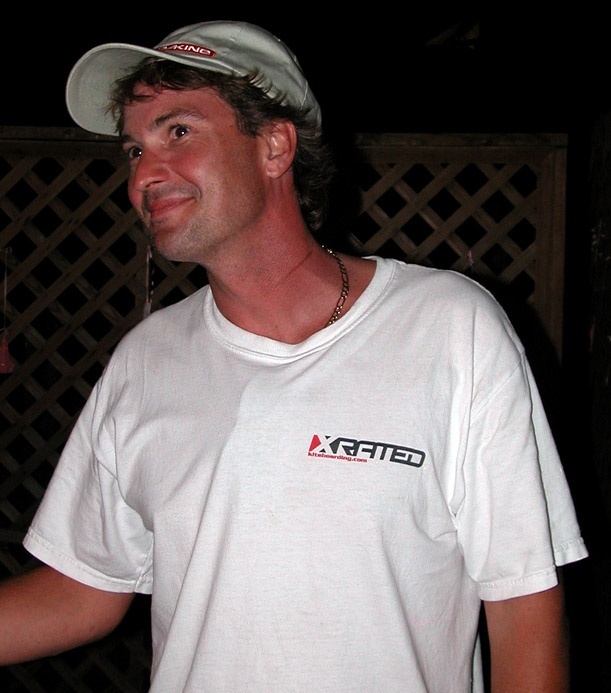 - 8 year kiter in the bay area with countless sessions in the surf. --> kite line wrapped around my ankle. What to do? Any input please let me know. To me this is one of the most dangerous situation in kitesurfing and despite reading so many safety forums/articles, it did happen to me. I wish Scott was as lucky as I was Thursday. All of my thoughts Scott.